English books are out of stock, available in french at the moment. This book is full of good information about the molas and the Kunas. Don't miss the opportunity to buy it. I am also authorize to sell and promote the book by the author, they are copyright in my country, these books are not available in bookstores or online in the USA. I will like to thank Michel for the effort, the great work, which allow all my customer to enjoy this awesome book. Thanks for making this possible. Nuedi! Hello" A friendly word of greeting. "Molas and Kuna Traditions" is the great title of this book, it focuse on the Kuna Indians tribes, Culture & Traditions, Nature, and their Daily Life. You are buying a brand new and rare to find book, this book is most specifically an invitation to discover the "Kunas" Indians and their famous "Mola" who contribute to turn this part of the world into an echo of paradise. You will meet the Kuna Indians of my country, while discovering their traditions and culture. It also has beautiful photos of Molas, The Kunas, San Blas Islands and more. If you are interested in learning more about the Kunas and their famous molas, then this book is for you. This book contains 52 pages, soft cover, the beautiful cover of this book is a young Kuna Women in her traditional Kuna Dress, you will see where the Kunas are located, it will also teach you about their ceremonies, also pictures of the Islands. 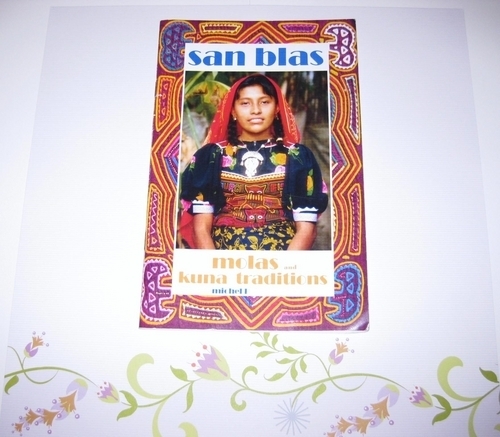 If you are a collector of Molas you will love to have one of these books. This is a book that you will treasure forever.